The Epson RX585 all-in-one printer is 43x43x19cm but once you put paper in the tray (vertical at the back) this adds 14cm to the last figure the height. Installation is reasonable although it does have several (linked) parts and once started just make a cup of coffee and look in on it a few times. It took around 15 minutes on a reasonably fast Windows XP system and I was 500MB of hard disc space down at the end. I found the getting started sheet okay but as it's only really a series of images I am not sure a 'total novice' would cope. While this is an All In One the only things that can be done without the PC turned on are of course copying but also printing direct from a camera card. While the front edge has a total of seventeen buttons the 5x4cm display gives quite a lot of information. An unusual feature is the ability to print borderless something rarely available except in the case of 15x10cm media. On my unit this was the default and my first test was to copy something and while this was less than A4 the output I received - using the defaults - was not what I expected, however a quick adjustment to tell it to have borders produced the copy I was expecting. While on copying I found this a feature that took just as long printing a black image as a colour one the time taken for both jobs was a rather poor 111 seconds. Printing by comparison when done from the PC was quite quick. Printing the less than useful 200 word document where you ignore the first and last copy to get a time produced an answer of 20PPM quite acceptable. The output however using the draft mode was grey. The same test on a more normal 1500 word document spread over four pages produced 16PPM. This mode was quite noisy and the paper snatched. 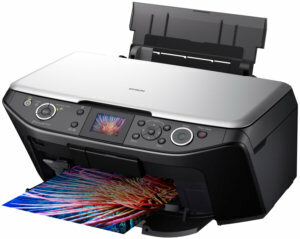 The unit actually has five printing modes draft, text, text & image, photo and best photo. The Epson Photo Print software has always been excellent especially it's ability to print four near 15x10cm images borderless on a single A4 sheet of photo paper. Using the best photo mode produced quite acceptable output in 132seconds this is the same time it took to print a single A4 borderless image of course this is on photo paper. The images when produced are all but dry and certainly not tacky as with some manufacturers output. Scanning was fine and it has the ability to OCR the scanned output or should you require it to reduce the quality of a photograph for sending by email. All of course can be done from a hand holding front end meaning the novice only needs to know what he wants to do and they do not need to know how to accomplish it. So slow as a copy unit (although it has facilities not normally available from the unit) printing direct from a camera card is fine and uses some of the extra features well. Printing text documents is okay but the fastest (draft) mode gives grey rather than black output. Higher quality modes are fine but of course slower. Scanning is also fine, printing via Epson Photo Print produces good output in quick time. It also has the ability to print direct onto CD's but as I currently do not have any of the specially coated CD's I could not test this. This is a six ink, six cartridge unit two shades of red, two of blue one yellow and one black. The cartridges are however not large and while Epson cartridges are not the dearest on the market that cost must be included in your calculations. Doing my Internet searches found the Epson RX585 at a best price of £85 including delivery from the first link below. Doing my Internet searches found the Epson RX585 at a best price of €117.45 including delivery from the first link below. Doing my Internet searches found the Epson RX585 at a best price of $119.99 including delivery from the first link below.